For double strollers that place children side-by-side, that they are often no more than four inches wider than tandem strollers renders them capable of fitting into the same spaces as wheel chairs. These strollers’ reduced vertical width and the shared center of mass between your two children’s weight will overlap to make it much easier to turn and push forward, and even as your children gain weight over time, the double stroller can still be forced beyond obstructions such as curbs with comparative ease. Finally, there will be less distance for you to cover in order to reach and tend to both of your babies at the front, and there should be fewer squabbles between them over seating. Tandem strollers better accommodate consumers that live in enclosed residential units and do not have as much storage space to spare. 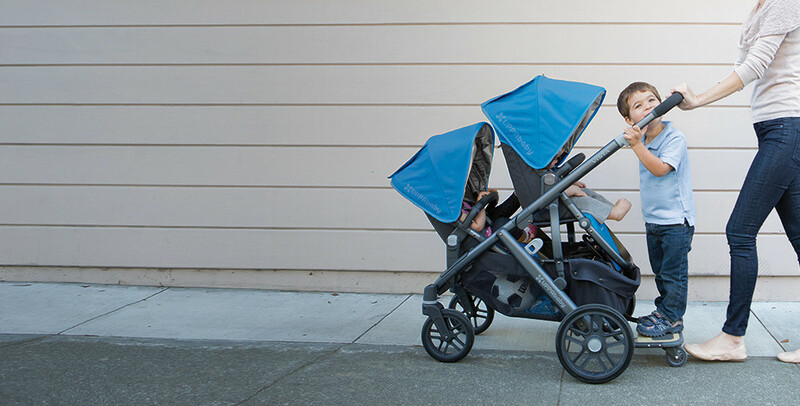 In comparison to a side-by-side stroller, the narrower construction of a tandem stroller allows it to navigate tight corridors more easily and to be folded into a more compact form when not in use. Meanwhile, each individual seat offers more room for the baby – enough that an infant car seat can be fitted inside it; this enables this type of double stroller to be used for travel. Tandem strollers come in variants that differ as to whether the two seats are facing each other or not, allowing you to decide how much or how little interaction you want between your children. In regard to each stroller variation’s respective downsides, side-by-side strollers unavoidably bear higher width and weight dimensions that prevent them from efficiently passing through narrow spaces such as elevators, and they cannot fold as compactly as tandem strollers. Not only is it harder to store them in closed spaces, but specific models that support infant car seats are also uncommon in the market. Finally, if you want to promote interaction between your children while on a stroll, they will be restricted by how they will both be facing forward instead of each other. The foremost downside of a tandem stroller is that the child sitting up front seat will remain particularly far away from you, forcing you to walk a fair distance if you need to tend to your child on short notice. However, some of your potential concerns over your baby’s security can be alleviated by the fact that certain models of these strollers allow your child at the front to be facing you. Other concerns include how your children may become more likely to dispute over who gets to sit in the “better” seat as they grow, and their growing weight will equate to you having a more strenuous time forcing the stroller past curbs. Finally, the vertically wide turns caused by the shape of this stroller increases the risk that you could accidentally let its front portion collide with people or objects if you are in a rush.